- Sari Colt on 六月 6, 2017. Canadian Opera Company(COC)’s 13th annual gala Operanation 2017, entitled “A Night of Curiousities,” took place at Toronto’s Four Seasons Centre for the Performing Arts, home of the Canadian Opera Company. It was a night to celebrate music and fantasy with many of the guests embracing this theme in their dress. 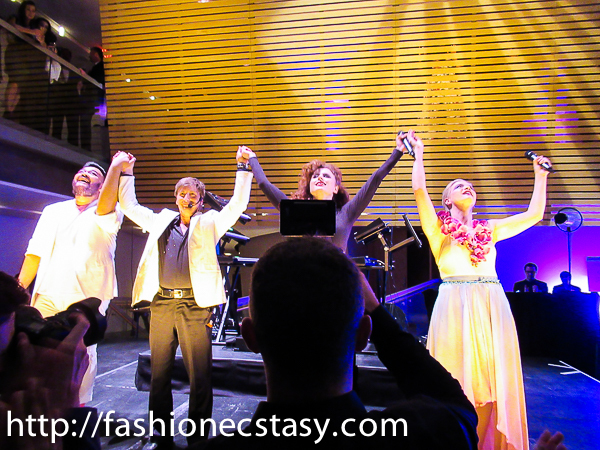 The gala raises necessary funds for the COC‘s Ensemble Studio. The COC Ensemble Studio, founded in 1980, is Canada’s top program for training young operatic talents. Through an audition process, selected members receive instruction on developing their skills. There are studio tours, recitals and special performances at the COC MainStage. Almost 90% of the graduates continue to make their mark in the arts. A highlight of the evening is the mashup of the COC Ensemble members performing with a known Canadian talent. Past years’ performers included Sam Roberts Band and Broken Social Scene. This year’s headline performer was Kiesza. She was accompanied by Gilles Parenteau and joining them on stage were COC Ensemble members Charles Sy (tenor) and Lauren Eberwein ( mezzo-soprano). It was a spectacular performance. Kiesza is a dynamic energy singer/songwriter whose known worldwide for her hit dance songs “Hideaway” and “Giant in My Heart.” At Operanation 2017, she combined her wonderful voice with her high energy dance moves. Kiesza told the crowd that she was so happy to be performing at Operanation with her former professor, Gilles Parenteau, who encouraged her to follow her dreams. Gilles Parenteau astounded everyone with his ability to use both his hands and feet to perform classic and pop music. He truly is a one-man symphony. COC Ensemble members Charles Sy and Lauren Eberwein sang some favourite opera pieces and later joined Kiesza singing backup for her. They are enormously gifted and have a huge future in the opera world. All four artists jammed on stage so wonderfully, mixing opera and pop. Guests were dancing and singing along. 10Tation Catering provided delicious hors d’oeuvres. Some of the unique items were “From the land + the Sea” which was braised leg of brome lake duck, stone ground cornmeal paired with potato chips, cod brandade chimichurri and olive tapenade. The South Korean food station had Korean beef bulgogi tacos topped with Korean lettuce, cucumber salad, pickled radish and kimchi, and Ahi tuna poke bowl. All three levels of the Four Seasons Centre had delights to be found. One had to go through the various hidden rooms to discover the secrets behind. There was a tarot card reader, a donut dessert tree, a photo booth and several bars to enjoy cocktails. One room had a classic operatic performance played being played on a tv screen. Before and after the performances. DJ Conor Cutz kept the crowd entertained.